This was done from a photograph I took, as my mum and I came home one evening on a vaporetto across the lagoon, after a long day exploring the islands. The sun was setting behind the San Salute and I waited to click the shutter till it shone through the windows of the dome, as I knew it would for only a few seconds. 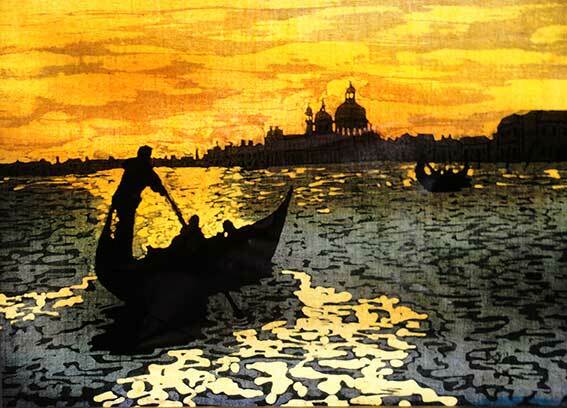 Just at that perfect moment, this silhouetted gondola crossed the sunset reflexion on the water. It was a stunning image! There's something incredibly exciting, after a week of intense work, to scrape off the wax, iron out the excess and then hold the finished work up to the light. 'Venice Sunset' turned out so much as I hoped it would, totally capturing the memory of that moment, it caused a sharp intake of breath! Every now and again I do a piece of Batik that has a bit of magic about it, that 'wow' factor and this is one of those.